Wow, what a trip. Before I dive into transportation theory and the ins-and-outs of Dutch biking design, I will mention that the trip was extraordinarily enjoyable. I must give the Dutch credit for their wonderful hospitality. Whether confused and lost at a transit station or burning with questions concerning design, I experienced nothing but kindness from those confronted with a clueless outsider. While I am no longer in the Netherlands, I brought back a box of De Ruijter chocolate sprinkles and have been eating like a king. Beyond that edible reminder and my extreme drowsiness after the early hour of 10 pm, the trip to the Netherlands provided endless new ways to think about transportation to my American mind. From useful public transportation to incredible networks of bicycle infrastructure, I encountered a country very different from my own. In previous posts, I covered Dutch public transit – a system of trains and the like that provide ease of access over moderate to large distances – and the city of Houten. Experiences with transportation in the Netherlands were quite different than that which I was accustomed to, especially concerning cycling infrastructure and culture. 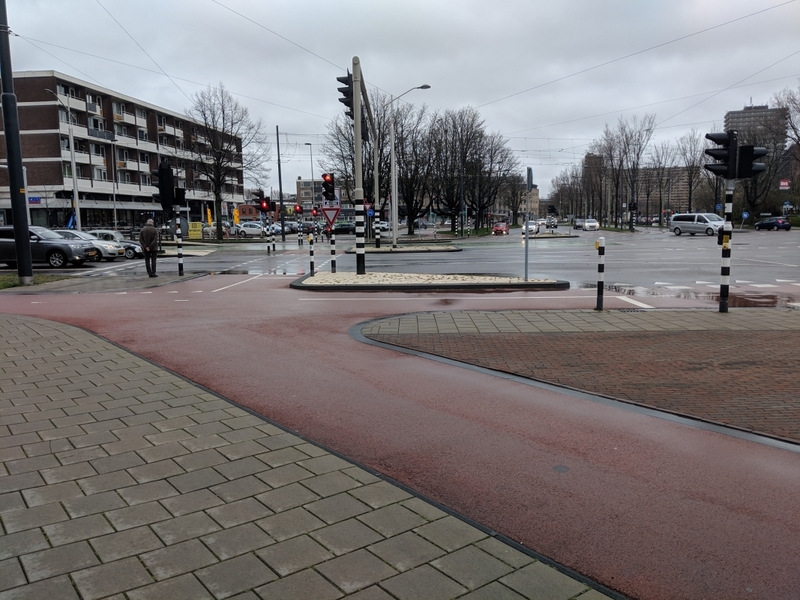 While one could talk all day about the roundabouts with separated bike traffic, or the grade separated bike paths, a key factor to Dutch design stood out to me. In almost everything, the bike was prioritized, seen as the top of the food chain. Car infrastructure and even pedestrian facilities often took back seat to the bike, a mode wholeheartedly embraced by the Dutch. This could be seen in Houten, where the cars are intentionally hamstrung with the ring road. While this compromised the efficiency of the car, cycling flourished in the vacuum. In the United States, many are willing to provide accommodations for the bike when convenient. The bike is relegated to an accessory, a fun little machine that is only feasible for a select few. Discussions surrounding bike infrastructure are dominated by talk concerning the reduced capacity for cars. Comparing the two countries, prioritization for the bike could not be more different. As a result, design for the bike differs drastically. 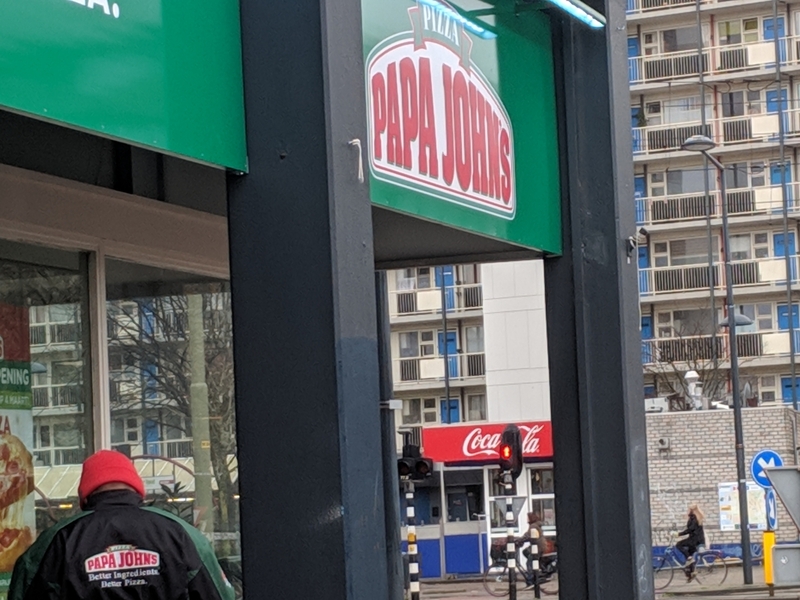 What has Dutch Culture Done to the Streets? 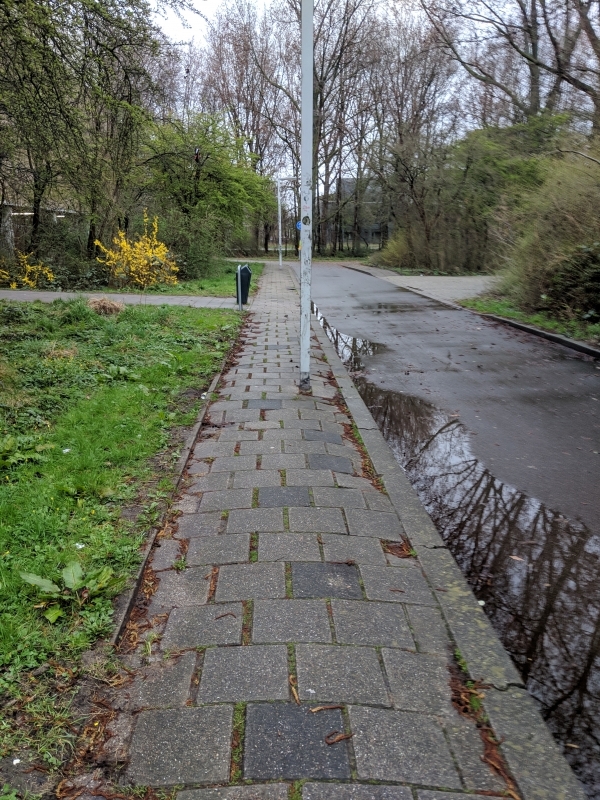 The infrastructure in the Netherlands strikes me as uniquely Dutch. Arriving in the Netherlands, the desire for beauty is immediately apparent. From the tulips to the Dutch Masters, the Dutch enjoy things that are pleasing to the eye. This quality extends to their transportation infrastructure. Never had I witnessed intersections so meticulously designed that they resembled art. Potted plants were used for traffic calming while public transit stations were known to contain archeological exhibits. On the bike tour of Delft, Dr. Jan Termorshuizen told me that “bike design in the Netherlands is an art”. Dutch culture drives the infrastructure to be beautiful and intuitive, all the while serving its purpose very well. This contrasts with the typical American approach where the numbers game leads to compromise and a check-box approach. What has the Bike Done to Dutch Culture? The Dutch have treated the bike well, and the bike has in turn treated the Dutch well. The taste of the bike has hooked this people due to its sustainability and consistency – not to mention that it is just plain fun. Because of this love, the Dutch are willing to remove barriers that could prevent its use and to create systems reliant on the mode. 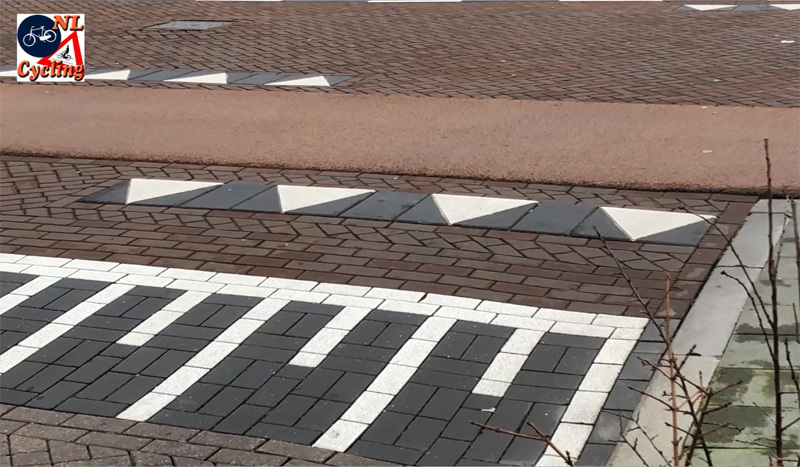 This first aspect is seen in Houten, where the bike drove the planning of the entire city at the expense of the car. Amsterdam demonstrates the second, where the government is pursuing a “car-lite” policy to restrict motor traffic in the city. Without reliance on and trust in the bike, this would not be possible to implement. With that, I finish some of the thoughts and insight prompted by the trip. I would like to thank those that make this possible, from the TAs Dave and April, to the professor Dr. Watkins, to the Dutch who went above and beyond in their tours and talks. Additionally, I would like to thank the Mundy family for sponsoring the program. The funding opened the door for me and many others to have an international experience that will surely impact a career in civil engineering and beyond. May your pedals be swift! Today the class toured the ins and outs of the Amsterdam public transit system. The quaint town of Delft is worlds apart from the port city of Amsterdam it seems. While that was the focus for the group today, our class of burgeoning bike infrastructure experts has reaped the rewards of a top-tier transit system composed of trains, trams, and busses. This system is certainly not compartmentalized in relation to the biking infrastructure – the two systems interact and complement one another. Bikes and transit are primarily integrated so that long distances can be covered by train or tram, while the “last mile” can be covered by bike. The system functions so that bikes can be brought on board trains and some other vehicles (trams, etc). Certain train cars are marked with a bike symbol to indicated space for a stored bike. Getting a bike into the station is moderately simple as well. One can simply bring them through the turnstiles. This can only be done on non-peak hours, however. When some of our group members took their bikes on board, they had to purchase a special pass for around 7 Euros. There are special provisions for foldable bikes, which can be taken on without charge. The emphasis by the Dutch, by far, is to provide quality bike parking in and around stations so that a rider may store a bike at a station without having bring the bike along for the ride. Many commuters will have two bikes: one for the “initial mile” to the station and one for the “final mile” once at the destination. This emphasis can be seen in the shear amount of investment in bike storage. Utrecht had multiple storage areas with the largest holding 12,000 bikes. 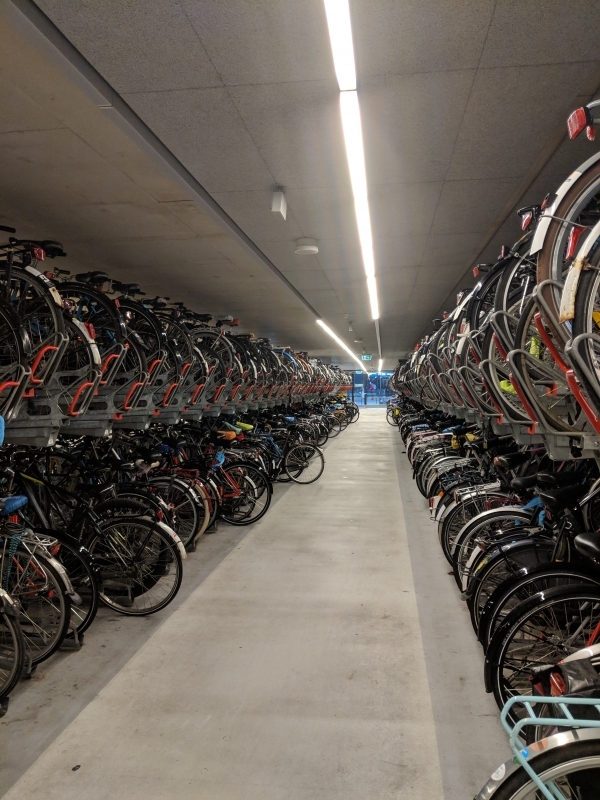 Den Haag, Delft, and virtually all major Dutch cities had large amounts of indoor bike parking at transit stations, while many cities were also in the process of building additional parking. Available parking is at capacity wherever one travels, showing the popularity of this approach. In these facilities, the exterior bike routes flow seamlessly into the garage, while location is always very close to the transit. This coordinated system does not only rely on bike facilities alone. The trains form a critical component and must function efficiently to drive usage. To measure transit performance, the Dutch focus on measurables such as ridership, total trip time, on-time arrivals, and dwelling time. In Amsterdam, we have seen a focus on reducing total trip time in particular, as the North-South metro line was a massive investment for the city with a total cost above 3 billion Euros. Efforts are made in the hopes that transit is reliable and responsive. As I have visited, trains are rarely delayed, and ETAs are posted in multiple locations. For trains and trams, there is a focus on dedicated right-of-way. This reduces delays caused by car traffic. Out of all modes, including bike and pedestrian, transit receives first priority. 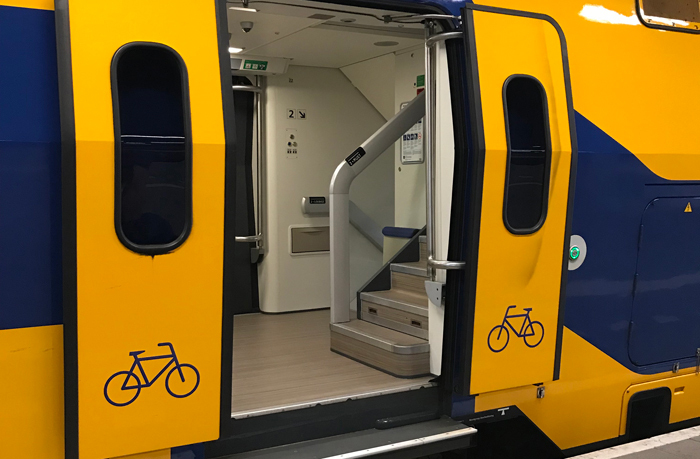 With this system in place, the Dutch have paved the way for a quality combination of transit and bikes so that people can move about with ease. 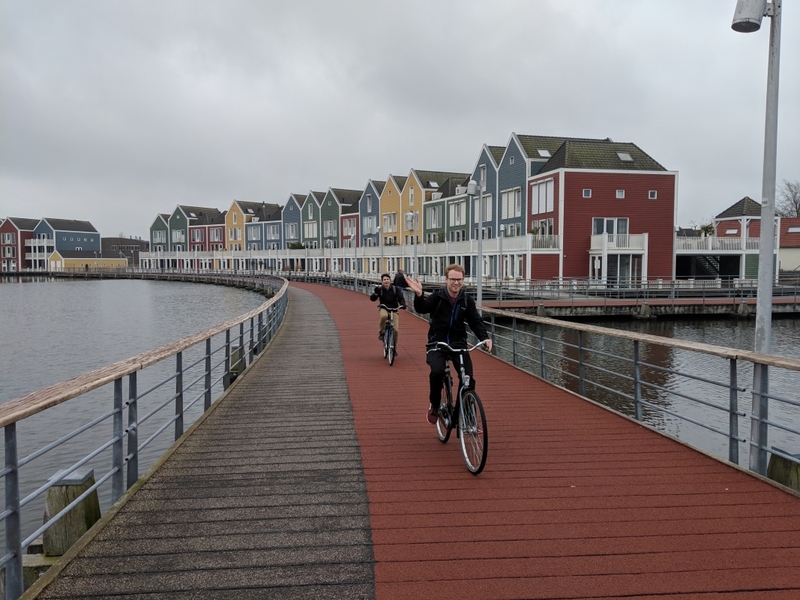 Houten, a city in the Netherlands, has a unique approach to transportation – even for a Dutch city. On Wednesday, the class rode a train out to the city, arriving around 10:30 am. Andre Botermans, a Houten City Planner and International Cycling Ambassador, gave the group a lecture providing background and information on the city. With roots as a small village of about 3,000, it was not until the 1960s that planners began to envision a city with 100,000 residents. At the time, the Netherlands were experiencing rapid population growth and needed more capacity. Houten seemed like a logical choice due to its proximity to the growing city of Utrecht. The residents, however, did not want such a rapid expansion, leading to a design size of 25,000 – a compromise down from the initial 100,000. With the size settled, planners designed a city that would prioritize non-motorized users such as bikes and pedestrians as much as possible. The pinnacle of this design came down to one aspect: the ring road. The ring road is the red line surrounding the developed portion of the city. On the road, cars can travel around 60 km/hr. This ring road is different from others found in cities, however, as it is the only road available for cars to navigate through the city. Cars may travel around the city and progress inwards to an extent, but no routes are available for cars that pass through the city. In contrast, there is an extensive network of bike path allowing direct routes for bikes. The impact of this design can be seen in the comparison below. As seen above, often a trip is faster by bike than by car. In addition, small details encourage walking and biking – such as parking placed a short walk from residences. Greenways provide beautiful routes for cyclists and pedestrians. The bike infrastructure is impressive, as shown in the grade separated roundabout that the group was able to visit. Could a Houten ever occur in the United States? 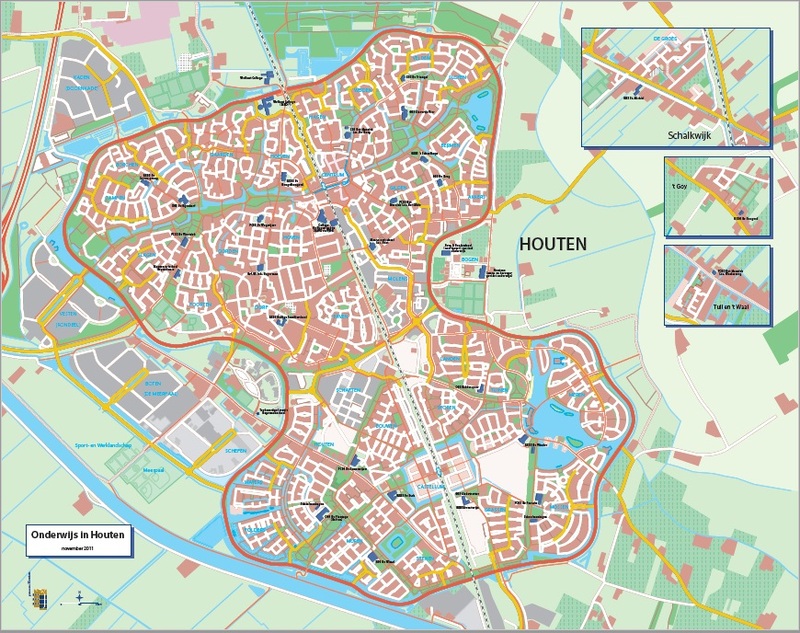 Houten is an interesting Dutch city to study due to its extreme priority for bike usage. When talking, Andre Botermans remarked that even other Dutch city planners have a hard time envisioning their own town with a similar plan. If it is hard for the Dutch to envision the scalability of Houten, then it is certainly hard for me to envision a similar plan in the United States. Certain barriers, such as public-opinion-driven spending threaten funding for a project centered on a mode used by a small minority in the States. Communities such as Peachtree City and Serenbe indicate that communities centered on vehicles other than cars as well as communities heavily planned can and do exist in the United States. Can Houten ever be the rule as opposed to the exception? This I doubt due to the niche nature of such a heavily planned and bike-centric community. With that being said, Houten is a concept that can be derived and applied in a variety of contexts and provides a valuable case-study. En hier zijn we allemaal! What a whirl of a couple of days it has been since flying into the Netherlands. My flight from Atlanta was a redeye, but I was fortunate to grab a couple of hours of rest. While I thought that I would be able to manage the public transit system, upon entering the airport station it was apparent that MARTA had not trained me well enough. By a stroke of grace, a friend not affiliated with the class who happened to be on the same plane assisted me with finding my train to Delft, as he had been to the country twice before. Upon arrival, I was able to stay with my new Dutch friend, Koos! He is a member of the Dutch Navigators and a friend of a friend of a friend! What a joy when things like this work out. While I could talk extensively about stroopwafles or 14th century churches, the infrastructure is the purpose of this trip and is what we have engaged with the most. Over the past few days, the group walked, biked, and rode transit. 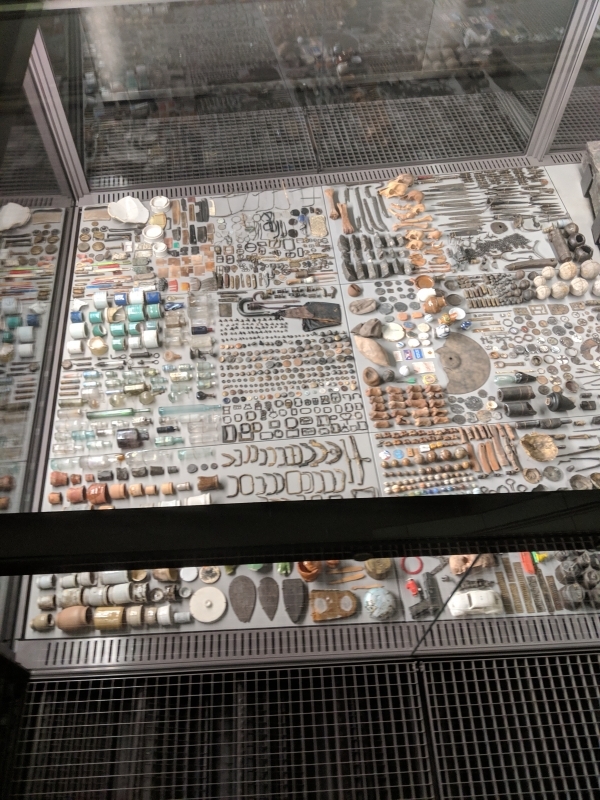 How does design differ from that in America? Grade separation is a wonderful concept employed by the Dutch. Raised grade crossings such as the one shown below intuitively indicate that the consistent grade has the right-of-way. This is one of the methods that gave me a sense of safety as I biked in front of cars. An interesting difference is that the Dutch seemingly compromise other modes for the sake of a strong cycling culture. Car capacity in Delft is reduced, transit ridership is reduced due to the bike’s convenience, and pedestrian facilities are sometimes smaller or have less investment. "I don't think that you would find a light post in the middle of a cycle track"
Using intercity trains in tandem with trams, navigating the country has been a breeze with travel from the airport to Delft, to Rotterdam, and beyond. The picture below touches on the beauty integrated into most Dutch designs. The image is from the Delft library. Inside are books, study spaces, recording studios, and much more. 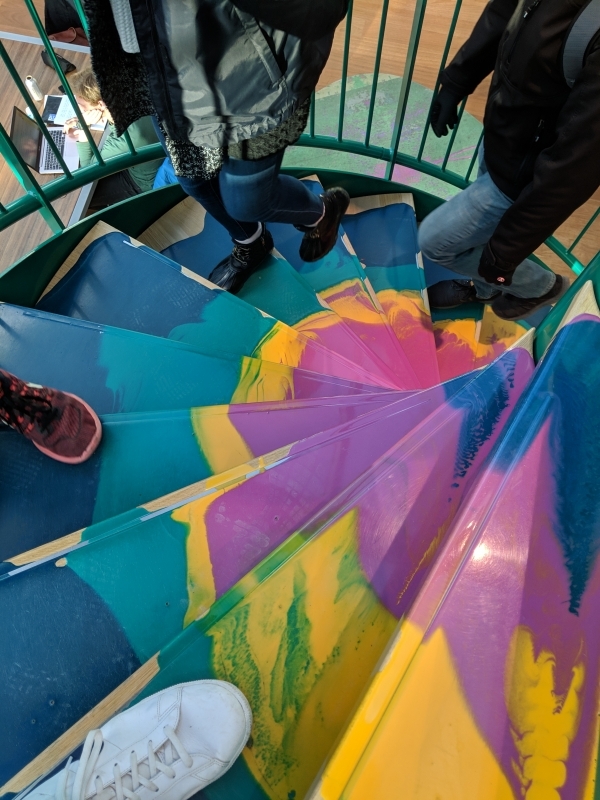 The library functions as a city asset but does so with a flare coming from painted steps, art exhibits, and more. This same drive is integrated into the Dutch transportation infrastructure. Rarely have I looked at an intersection or roadway in the US that caught the eye. They are quite common here, however. In everything, the Dutch demonstrate an eye for detail and a priority for the bike in all transportation planning and design. 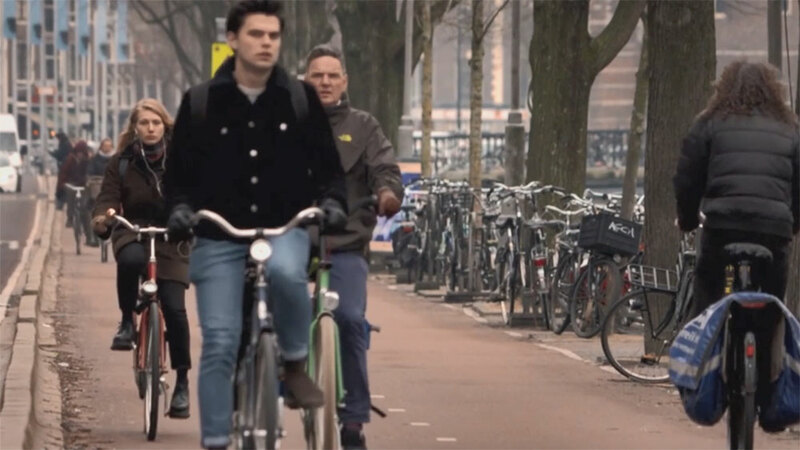 Whether cruising on a bike superhighway in the country or safely navigating an intersection with separated bike traffic and bike-centered signal timing, cycling is a mode positioned in the Netherlands to be popular for years to come. City Cycling, edited by John Pucher and Ralph Buehler, examines the “Cycling Renaissance” currently seen across America and elsewhere. The book portrays trends in cycling but also identifies what measures most effectively increase cycling levels, safety, and accessibility to all segments of society. Chapter 2 is a broad overview of cycling trends compared from country to country. The difference truly is astounding, as shown by the figure below. While all countries compared share a “Western” culture, the difference in the extremes of cycling utilization as a mode of transportation is stark. In fact, the major city in the United States with the largest share of cycling, Portland, has the same percentage of bike share of trips as Stuttgart, the major German city with the lowest share of bike trips. To bring things closer to home, in 2016, Atlanta saw just 1.4% of trips made by bicycle (cite). While this is above the US average, the number demonstrates the room for growth when compared with that of cities in Northern Europe, which can see as many as 40% of trips made by bike. Of interest, Atlanta has set a goal of 4% for the year 2030. Atlanta also has the longest average commute distance out of the top 96 metro areas in the United States with an average commute of 12.8 miles (cite). Longer trips are less likely to be completed using a bike, putting the Peach City in a tough spot. Chapter 2 of City Cycling also discusses the relationship of car ownership and cycling as a mode of transportation. Germany demonstrates that the two can go hand in hand, which surprised me due to my initial suppositions that the two would be in tension. 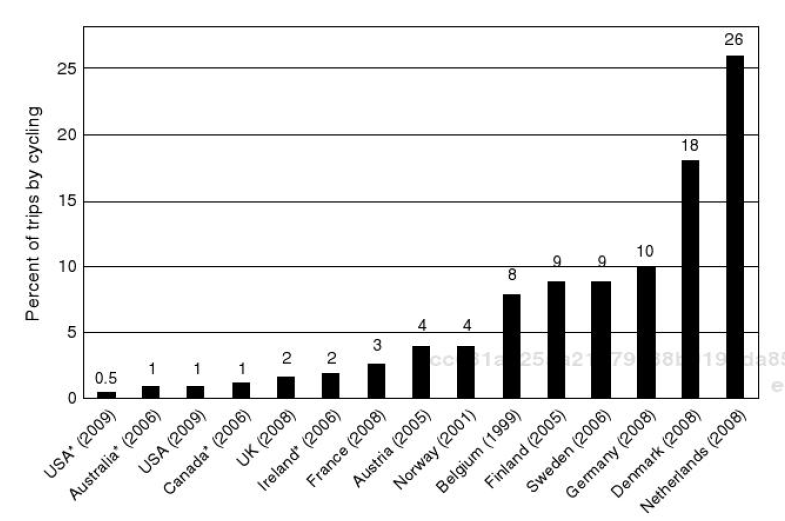 In reality those in countries with high rates of cycling do not NEED to drive their car due to quality biking and public transportation systems. Additionally, countries such as Germany and the Netherlands educate school-age children in bike riding. This would be radical in the United States, which probably has an influence on the fatality rate that is five times higher than that of the Netherlands for cyclists. Looking at cycling facts, figures, and plans published by the Dutch government, one cannot help feeling that the Dutch love their bikes. This is validated by the fact that around 60% of the Dutch population associates the bike with “joy”. As seen in the previous paragraph, the popularity of cycling varies greatly from country to country. While there are many factors leading to this reality, a comparison of the cycling infrastructure will give a picture of the differing mentalities towards cycling. A major difference in the two approaches can be seen in the way bike and car traffic are treated in relation to one another. The United States has traditionally pushed to integrate both car and bike modes, leading to the commute warriors brave enough to cycle with cars flying by. In contrast, the European approach is to separate the two modes. Furth lays out a logical case for this approach: bikes do not contain crumple zones, airbags, or cage construction, while separating people from danger is a foundational to industrial safety. Combined with the lack of enjoyment resulting from traffic, separating the modes seems to be a rational conclusion. Yet the AASHTO bike guide demonstrates an aversion for separate facilities, claiming that faster riders would prefer a shoulder on a road to a protected facility. As one who often engages in sport cycling and is faster than the average biker, I cannot get enough protected facilities. In Georgia, the PATH Foundation has sponsored many separated facilities that I have enjoyed for both recreational and utilitarian purposes, ranging from the rails-to-trails Silver Comet to the essential PATH Parkway. While the slightly higher speed that I could experience on a road is nice, the chance of death generally dissuades me from choosing to mix with cars over other cyclists. Vehicular Cycling, or VC, is a concept that I had not been introduced to before this semester. The concept, that bikes should operate as a vehicle on the roads is certainly one I have brushed with, and I have often been instructed to “take the lane”. While this philosophy that separation hold danger has taken off in the past, the current trend in cities such as New York, Portland, and even Atlanta leads me to believe that this new generation of planners and designers take after the Northern European approach of separating the modes – an approach that has proven to increase safety and ridership. Stepping from the world of separated facilities to those of painted lines seemingly invites misconceptions and complications. Space required is often underestimated, leading to the danger of cyclists running into doors, while cars can easily invade the space through illegal parking. While bike lanes and the like seem to have legitimate applications, they are often placed on roads with too high of a volume, too high of a speed limit, and without enough buffer space. Chapter 8 deals with the integration of cycling and public transportation and a comparison of this concept between North America and Europe. As a civil engineer specializing in transportation, I have learned some about public transit. As a Georgia native that has never been to Europe or Asia, however, the workings and benefits of buses and rail lines are still foreign to me. Due to this, chapter 8 was intriguing and witnessing quality public transportation remains an important interest as I look towards the trip to Holland. Theoretically, the combination of a highly accessible mode such as bike and a highly mobile mode such as transit has the capability to complement each other nicely, creating a great opportunity. Much of the section discusses the importance of secure and convenient parking in joint cycling-transit operations. For years, European nations like the Netherlands have invested in bike parking with proximity to rail stations and city centers where trips originate and end. This approach has led to the Netherlands holding space for more than 325,000 bike parking spaces at train stations, with more needed. The Dutch also maintain “bike stations” and “bike lockers”, facilities that offer top-notch security and convenience. In class we have seen pictures of such facilities, but I am interested to see them in real life and to witness their use by commuters. In contrast, the North American approach has trended towards allowing bikes on board buses and trains, with less of a focus on park-and-ride. Buses hold front racks (MARTA, Atlanta’s transit authority offers this service, but I rarely see it used), while in most cases bikes can be taken on board heavy rail. San Francisco trains have a dedicated car for bikes. Regardless, American systems are beginning to take notice of the European approach and are increasing capacity for bike park-and-ride. In both the Netherlands and the United States, bike share programs have become popular for their convenience and low cost. While often used for recreational use, bike share can be strategically placed at transit destinations to allow users to combine bike and transit without need for personal bike parking. In Atlanta, the Relay Bikes system offers bike rentals and has become relatively popular. OV-Fiets is the Dutch version, which has over 200 rental locations in railway stations. The integration of bike and transit networks also lags in the US, where an emphasis on recreational riding has neglected placing routes near transit hubs. To make things more difficult, transit networks are sparse, so that the incidental crossing of the two is rare. This is of course very different in the Netherlands. Chapter 12 visits small cities in the US and Europe to discus the conditions and factors leading to strong cycling cultures in smaller settings outside of places such as New York or even Amsterdam. The cities studied were Davis, CA, Boulder, CO, along with Odense, Denmark and Delft, the Netherlands. The levels of infrastructure investment and cycling culture in Davis and Boulder are remarkable with the rest of the United States in mind. Davis in particular has a rate of bicycle commuting that would not be entirely out of place in Europe. With both US cities, it is interesting that cycling has been an emphasis long before the recent “bicycle renaissance” of the 21st century. The trend arose during the 80s or earlier as city officials sought to create communities resistant to urban sprawl that is accompanied by automobile dependence. Boulder officials acquired 43,000 acres of empty land surrounding the city to prevent sprawl. This brought to my mind the British Green Belt. In both cities the community seems to have developed a distinct cycling identity, a property that few large cities are able to grow with such wide success. Delft and Odense are both interesting case studies. 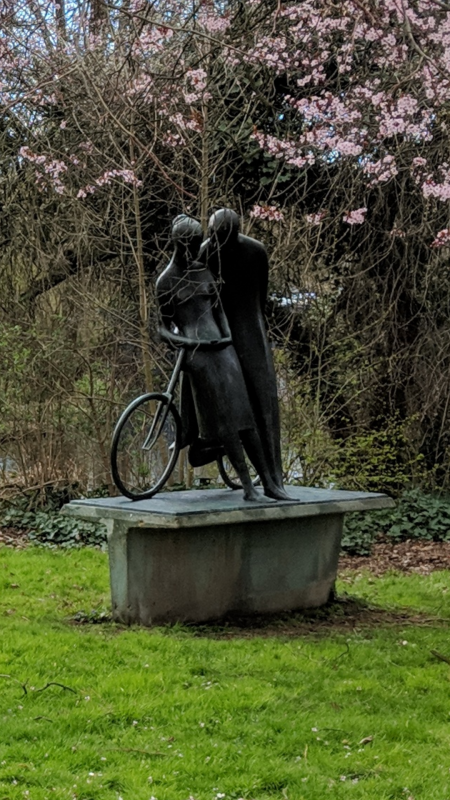 While facilities were present and of high quality, public involvement campaigns made a large difference in the willingness of the populace to use bikes as a frequent mode of transportation in Odense, which intrigues me. This is also true but to a lesser extent with Delft. These cities demonstrate the public engagement factor of cycling as a mode of transportation, which should not be neglected. As covered in the previous sections, small cities have unique opportunities when it comes to implementing cycling as a mode of transportation. While larger cities (over 1,000,000 people) must approach cycling slightly differently, there are still ways larger cities have found to implement a cycling culture. Large European cities such as Amsterdam are notable not just for their commitment to cycling, but for a history of such stretching back for decades. In America I am accustomed to new buzz about cycle tracks and paths, but to think that this has been going on for years elsewhere is incredible! The car restrictive policies cause my inner driver to cringe, but I know that they are implemented for the greater good. Additionally, reading of the progress made in cities such as Portland, Minneapolis, Washington, and others causes me to want to take a trip out to visit. Portland, in particular, is intriguing with the social aspect of an active biking community. In conclusion, the Dutch approach of separating modes of transportation, integrating cycling and transit, and public engagement initiatives have led to a rich cycling society where 27% of trips are completed on bike. The decades of prioritizing cycling entrenched the bike into Dutch transportation philosophy and ensure the popularity of the mode in the future. My decision to take this course, Sustainable Transportation, was primarily motivated by a desire to grow in my understanding of quality transportation design concerning bikes and in general. Once I became aware of the mentorship component, however, I couldn’t help but to become even more excited! Mentorship has played a role in my life in many capacities, and I am hopeful to gain wisdom concerning its application in professional settings – as well as in general. It is my belief that people can impact the world around them for the better and that this ability is closely tied to our purpose, as life is lived one day to the next. While this ideal sounds wonderful and nice, participation is not so simple as the quick “flip of the switch” of acknowledgement and agreement. If this ideal is to be embodied, a long and involved process – growth and development – must occur. Mentorship fits nicely into this journey and has been an integral component for many, me included. Mentorship is a valuable vessel for growth in a myriad of ways. In a culture obsessed with the idea of independence – glorifying the “cowboy that don’t need nobody”, one might say – mentorship stands as a testament to our need and dependence on others. A proverb states “When pride comes, then comes disgrace, but with the humble is wisdom”. The mentored must let go of the pride that all situations can be overcome from within, while the mentor must admit in humility that others need be fostered if a reality better off is to be had. Through this process do we grow in wisdom. With that in mind, mentorship is a powerful tool allowing the transfer of knowledge and experience from one to another. While classrooms are useful, mentorship harnesses our nature as social beings due to its relational nature. Teaching and instruction can be personalized readily based on the needs of the mentored and the strengths of the mentor. Additionally, the relational nature builds a bond that allows for openness and honesty in failure – a state that provides some of the most valuable growth if approached wisely. While in isolation an individual can either hide or be unaware of failure, in a mentorship relationship an outside party can provide understanding and careful correction. If everything stated beforehand is true, then I can imagine everyone would want mentorship as a component of their life. There are, however, a few hurdles – notably that entering into a mentorship relationship is dependent on an outside party. We much find and work with a mentor if any of this is to come about! Seeking and working with a mentor is anything but a passive process and is not the path of least resistance. As with any quality relationship, there must be intentionality, clarity, and direction – all of which take energy and thought. Before seeking a mentor, develop a vision and purpose as a foundation. This will provide direction as to who could provide the experience desired. Additionally, potential mentors must be able to gather that one is committed to the desire to grow through mentorship. This is shown through visibility, responsibility of character, and appreciation for advice and feedback. The current mentorship relationship I am involved in resulted from an intentional conversation where I expressed interest in such a thing. Cultivating relationships in this manner will prove helpful for finding a mentor. Relationships are two-way streets. If we are to hope for a committed mentor, we must also commit to mentorship. Practically, this means simple things such as timeliness when meeting or due diligence towards readings or other things recommended by your mentor. One must not just prepare for criticism but hope for and embrace it. While one need not accept all feedback as law, in humility one must seriously consider feedback that conflicts with initial understanding. This will also help build trust in mentorship, a valuable component. If I were to dismiss the thoughts and ideas of my mentor casually, it would not be long before the collaborative relationship became compromised. Leadership is a common buzzword for every previous generation and will continue to be for a long time to come. We read about leaders in articles and see them portrayed in movies. Especially at a school like Georgia Tech, where the big fish from every little pond are gathered, do we hear the idea of the leader pitched and encouraged. This fuss is for good reason, as an individual able to gather others together can accomplish the incredible. We see the effects of a quality leader, but to know the traits that define a leader is a different and worthwhile discussion. In order to lead others, it is essential to know oneself. Because all leaders are people in the end, no two styles will be exactly alike. A successful leader knows their own qualities and leads out of them (Vora 2014). As a civil engineer passionate and interested in transportation, if I were to lead a structural team looking to design a building the effort would likely end in disaster – but directing a transportation project would engage my strengths. This is a pretty simple example, but the principle holds true that we must seek to know our capabilities to lead from them. Likewise, a leader must be in touch with others and know their characteristics as well. Building off the previous example, even if I were to lead a transportation project, something tells me that the result would not be great if the team was composed of structural engineers, even with my transportation expertise. The fact remains that a leader is nothing without those who are led. Building off the strengths of your people is vital. Additionally, in the realm of building with your people in the global economy, there is a need for cultural sensitivity. This can either muffle or amplify a team’s effectiveness. Feedback or criticism is an essential but hard tool. Without it, ineffective or destructive practices continue, but when approached poorly can lead to shame and alienation. The basis of feedback is confrontation, we must look to confront well. Confrontation is best done early and understandingly. Giving needed feedback soon upon noticing something unhelpful is necessary because if a bad habit persists it causes damage and affects our ability to be gentle and understanding in our confrontation. Giving feedback in an understanding manner prevents the interaction from becoming an unhelpful roast session that temporarily makes one feel better but is damaging in the long run. Feedback is effective when it focuses on behavior and things that are able to be changed (Petersen 2013). Personality and certain other qualities are static – find and focus on what can adjust. Changing is a tough process, so speaking to the other party’s interests while expressing your own hope for their success can better motivate change. An important understanding when giving feedback is cultural sensitivity and an awareness that standards in communication are not universal. Certain cultures such as British and Korean cultures give negative feedback in a very indirect way, while others such as German, Dutch, and Russian cultures tend to be very blunt and forthcoming with feedback. (Meyer 2015) When these approaches mix, things can go awry and tempers flare. The best approach is to consider cultural norms and how this affects the expectation for feedback others have. Additionally, this consideration is important when interpreting criticism received. While this is no exhaustive guide, it is essential for one to be open and understanding when seeking to give feedback across cultural boundaries. 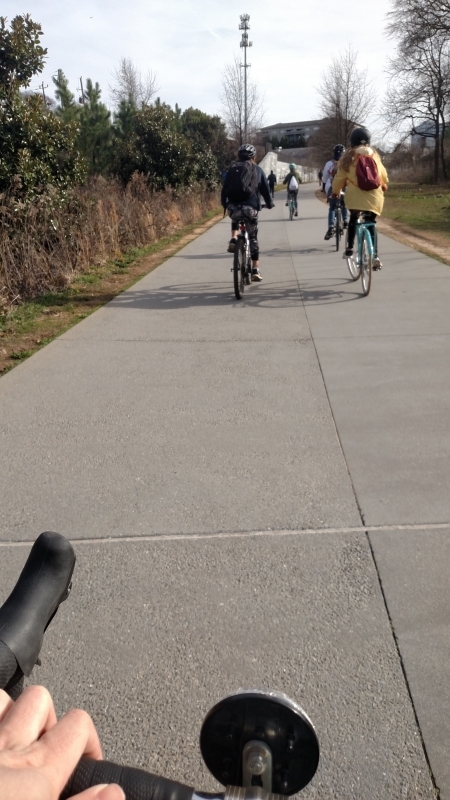 Last Friday (2/8/19), the class went on a tour of cycling infrastructure that has been developed in the city of Atlanta. Observing domestic infrastructure in a course designed to study Dutch cycling infrastructure was something I looked forward to in the previous weeks when it was scheduled on the calendar. This is because a hope for the course is that I grow in familiarity with both systems, so that helpful comparisons and contrasts can be made such that American infrastructure can develop – and commuter cycling flourish. 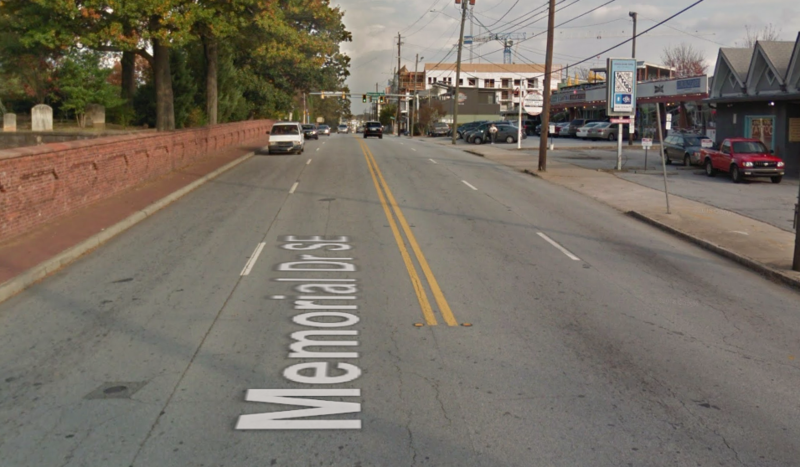 By Dutch standards, Atlanta must seem like a wasteland of bike infrastructure. In light of the recent history for the “Dogwood City”, however, the attention to bikes in recent planning and design is a revolutionary departure from that yesteryear when car culture was the near exclusive consideration. Below are some comparison photos I was able to piece together in order to illustrate the changes happening all over the city! In addition to urban bike lanes and cycle tracks, Atlanta is the home of the famous BeltLine, a multi-use path allowing walking and cycling. After a graduate thesis in 1999, the first section of the trail opened in 2008 and has been adopted into the culture of the city, where it has given vision for a sustainable, multimodal, and fun transportation network. The tour began in hectic Tech Square with our group of cyclists, ranging from battle-hardened commuters to some who had assembled their bike just a few days prior. My experience falls towards the more experienced end, and this is important to keep in mind when considering my interpretation of facilities encountered on the ride, as people would typically find situations less comfortable than I do. The initial mile or so through Midtown was defined by unprotected bike lanes and quiet residential roads with mixed traffic. The bike lane seemed to promote an awareness that cycling traffic should be expected, but from a functional standpoint did not protect the group. I still found myself cautious, wary of car doors and weaving traffic, despite the dedicated facility. The slow residential roads provided a fun and leisurely experience in contrast. The group was able to fill the lane and didn’t feel out of place at all despite the lack of design features. Setting and type of traffic certainly made a difference in this situation. And through it all, traveling as a group gave a feeling of safety and even a sense of belonging. At 10th Street, we encountered our first cycle track. Grouping together before heading down the track, our guide and professor, Dr. Kari Watkins, noted that this was the first segment that separated bike and car traffic in the city, opening in 2013. This has become the first of a few cycle tracks in the city, many sponsored by the City of Atlanta and PATH Foundation. While I had ridden this segment quite a few times, I’ve always found it to be quite fun (at least when going east, downhill!). While the bollards may not be the prettiest, they give me enough of a sense of separation and protection to enjoy the ride. Similar to the cycle track in that it separates from motor traffic, but different in that pedestrians make up the majority of traffic, the BeltLine was encountered next. This path had a noticeably lower design speed, and the group slowed down to not bother those walking. Our guide explained that pedestrians often will not keep to the right side of the path, which can lead to a hazard for those passing by bike. This is due to the unwillingness of the authority to paint guide stripes for aesthetic reasons. As a result, cyclists learn to slow down and to pass warily. Beyond this, the facilities encountered were similar to those already covered. Downtown has a new smattering of cycle tracks, which have likely been easier to install when compared to the Midtown counterpart due to an under-capacity road network. Biking back to campus from Downtown truly gave a sense of the connectivity and integration beginning to arise concerning the cycling network. Beyond the roads traversed on the tour, however, many roads in Atlanta remain inhospitable to cycling. Memorial, the road to be studied and redesigned by my project group, is a truly harrowing experience at most times of day. This is just one such example of a vital route that practically only allows motor traffic. For this blog post, 6 YouTube videos from Mark Wagenbuur (YouTube handle = Markenlei; web page bicycledutch.wordpress.com) were watched to help contrast what was experienced on the tour. While the Netherlands had their own bout with car-centric culture, the 70s saw a shift away from motor vehicles and towards cycling. This was done for multiple reasons, notably safety and environmentalism. Social protests brought political and culture change, creating the transportation approach enjoyed today. From a design standpoint, the Dutch focused on separating bikes and cars. This is a fundamental shift from the philosophy of the Americans, who pushed for the integration of bike and motor traffic. On the Dutch side this has led to leisurely, safe, and approachable cycling options, while the American mentality created a system only available to the lean and mean road warriors that are comfortable taking the risk. When thinking of a cyclist in the States, legends such as Chris Froome or Greg LeMond (let’s not bring up that Lance fellow) come to mind, with their aerodynamic bikes and lycra clad outfits. From the Dutch perspective, it seems that the outlook is shifted more towards upright bicycles with the rider being far more relatable to the average person like me and (most likely) you. The Dutch employ numerous design strategies to create a safe and functional system for bikes and pedestrians. 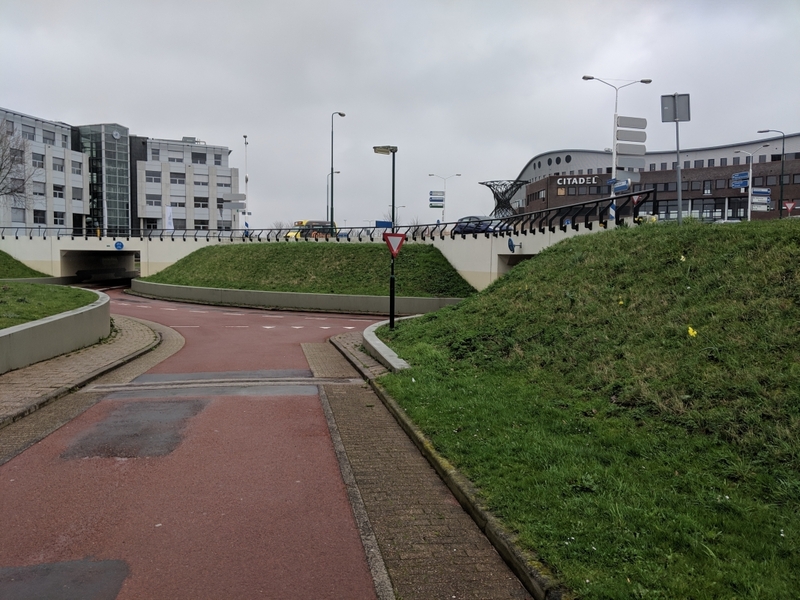 Grade separation, roundabouts, and yielding to the most vulnerable are all core design features used by transportation engineers in the Netherlands. Decades of experience also lends to the correct application of different design features, often a mistake of US engineers implementing a system with no prior expertise. 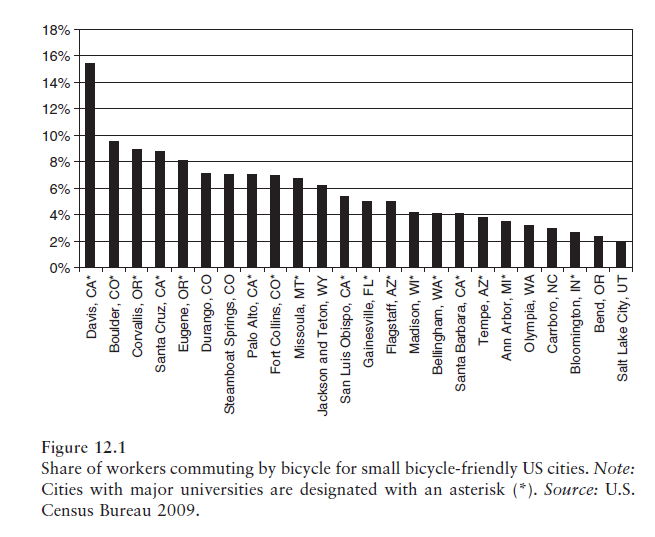 With all this in mind, it is quite clear that cycling in the US is remarkably different than in the Netherlands. This is likely due to a variety of reasons. In the States, gas is cheap, space is available, distances are large. Safety is often sacrificed for speed and throughput, a departure from the ideals of the Dutch. Additionally, the sport cyclist is idealized, a user better suited to mixed traffic than the average (potential) user. Fortunately, as illustrated in Atlanta, dedicated bike facilities are becoming more common in the States, especially heading into the future. My name is Liston Mehserle, and this semester I’ll be writing blog posts exploring sustainable biking infrastructure throughout the semester as I take CEE 4660, Sustainable Transportation Abroad. Previous to attending Georgia Tech, I lived in a medium-sized town by the name of Perry, located an hour and a half south of Atlanta. My experience with transportation there was not in any ways what one would think of as sustainable or effective. While I once saw a small sign noting an intercity bus service, public transportation was nonexistent. More recently the transportation authority has been painting bike lanes on certain routes, however a culture dominated by automobiles lead to high speeds and a lack of mindfulness of cyclists that removes the option for all but the most reckless of those looking to travel on two wheels without a motor. 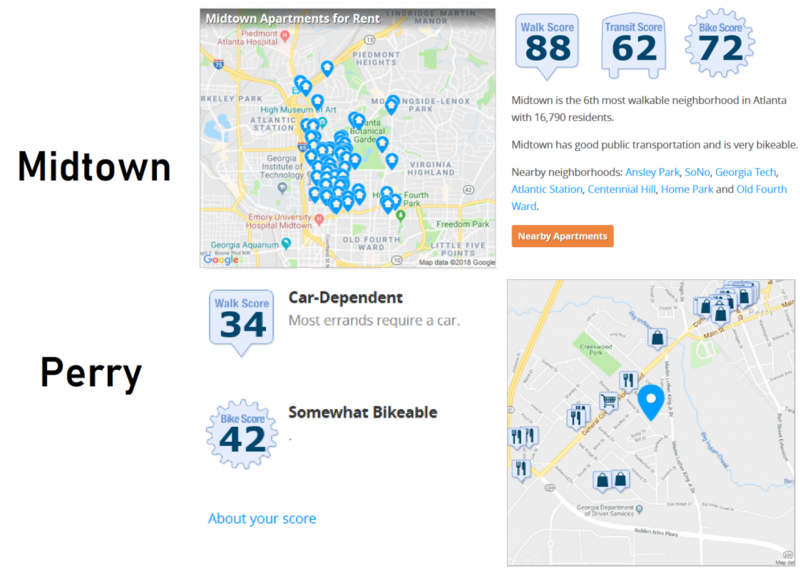 Shown below is a comparison of Midtown and my home zip code from Walk Score. Lack of infrastructure for all but the automobiles is a theme, as sidewalks are few and far between. There are multiple factors leading to Perry’s approach to infrastructure. Rural development with its lack of dense planning created large distances between residents and points of interest. It is not unheard of to travel 15 miles or more to a point of interest, especially if located in an outside community. Perry’s start as an agricultural society led to most residents depending on trucks and other vehicles to haul equipment and resources. Ultimately, the general apathy towards transportation effectiveness and lack of concern towards personal or environmental health leads to a situation where there is little to no outlook of improvement to the transportation system. In all fairness, I had no interest in transportation before arriving in Atlanta. In my mind, only one metric mattered: speed. It was not until a radical conversation with a traffic engineer, where it was remarked that a goal for Midtown was to slow traffic, that the gears began to turn, and I started to realize the dynamic nature of transportation. Over time I also began to bike quite a bit. Initially my interest in biking was more due to fascination with the mechanical side of the machine, but over time I’ve begun to value cycling more as a mode of transportation. This is due to the experience I’ve had zipping around Midtown by bike. Biking as a mode has proven to be loads of fun and has convinced me that the bike is the best way to get out and experience your surroundings. While I may drive past a small shop in a car and completely miss it, the lack of separation from the environment and reduced speed of a bike allow for a more mindful transportation experience. With that, we now come to my purpose in taking this class. While I’ve enjoyed biking, it is not hard to make the claim that the bike as a mode of transportation in America (especially the South) is severely underutilized. Looking at places like my hometown and even much of Atlanta, the lack of quality biking infrastructure serves as a major hurdle if people are to view biking as a legitimate option for all. Additionally, beyond the physical barriers, I hope to investigate any cultural factors that stand in the way of cycling. Studying the Dutch approach to cycling excites me as the bike is ingrained in their culture and is prioritized in their approach to transportation. The Netherlands should serve as a great case study as I look to start a career in transportation that can hopefully bring the bike and public transportation to the forefront of transportation in America. Additionally, I’ve never had the opportunity to travel to a country outside of the United States, so I would be remiss not to mention the fact that I am grateful and downright excited to visit a new culture and setting. Be it the tulips or the herring, I am ready to visit the Netherlands!